Create: Opens the Create Virtual Service popup. Edit: Opens the Edit Virtual Service popup. Service Engine Group: The group from which Service Engines may be assigned to the virtual service. # Service Engines: Shows the number of SEs assigned to the virtual service as a time series. 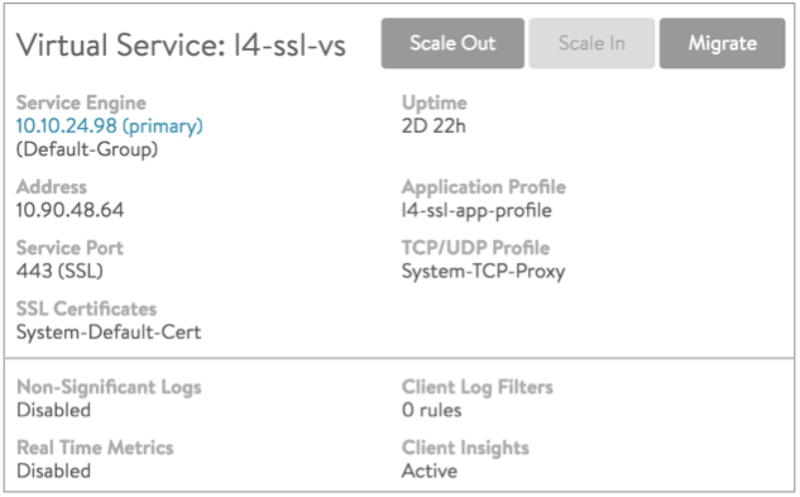 Useful to see if a virtual service scales up or down the number of SEs. Open Conns: Avg number of open connections. Client RTT: The average TCP latency between clients of the virtual service and its SEs. Server RTT: The average TCP latency between back-end servers of the virtual service and its SEs. Error Conns: Rate of errored connections per second. Rx pkts: Average rate of packets received per second. Tx pkts: Average rate of packets transmitted per second. Policy Drops: Rate of total connections dropped due to VS policy per second. It includes drops due to rate limits, security policy drops, connection limits, etc. DDoS Attacks: Number DDOS attacks occurring per second.